The following authors have registered for the 2018 Book Festival. Click on their names to go to their author feature here on the site. 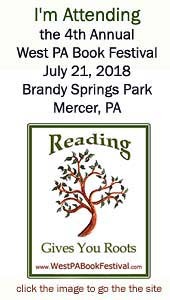 Author Registration: We are accepting registrations from authors who live/work in the West PA area. So far, this is a local area author event. Our space is limited and we accept new authors on a first-come, first-served basis. Please email staff [at] westpabookfestival.com to request a registration. Mercer American Legion Auxiliary sold hoagies to raise funds for their group.